Here's my month of softies entry, hopefully on time. It's not quite how I envisioned it, but I ran out of time. They're cyclamen blooms and leaves. I really like cyclamen, but because I always forget to water ours, they don't usually do so well at our house. So I made myself an ever-lasting cyclamen. I had plans to make the pot too, but since today is the last day of May, this will have to do. 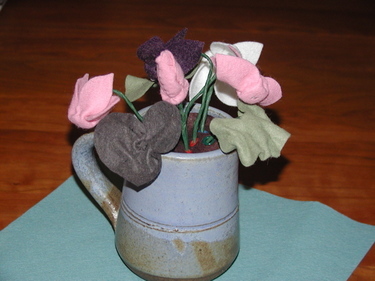 These are made out of wool felt, a button, craft wire, and floral tape. The dirt/flower holder (which is invisible here) is brown felt with eyelets punch in for the flowers to go through. I've finally returned from disk-crash hell. Luckily, (after only 1.5 weeks of work) I was able to recover most of the files from my old computer and transfer them to my new computer. Thanks to everyone for sending good vibes my way, I think they really helped. I'm very pissed at my backup software, Retrospect. I'd been doing daily backups, but somehow my backup became corrupted. The helpful man on the tech support line told me "yup, it sounds like your backup is corrupted. Your best bet will be to get your data off your old computer." The old computer that I had just told him had a dead disk. Thank you very much sir. And for this ever-so-helpful piece of advice, they charged me $40. So now I'm just going to do tar backups. Not buying their software again. But that's the past, in the present I'm happy. I was close to ecstatic to get my bookmarks back this morning so I could see what everyone else has been up to. I have a few blog links in my blog, but I check in on many more but haven't gotten around to putting them into my typelist yet. I kept feeling I was missing a lot, and it turns out I was. I forgot my camera at home this morning so I can't post actual pictures, but I've been doing little more than recovering my computer so there aren't many pictures to post. However, I am working on some flowers, maybe I'll get them done in time for MOS (which I realize means I need to finish them in the next, like 2 minutes). Ah, it's so good to be back! 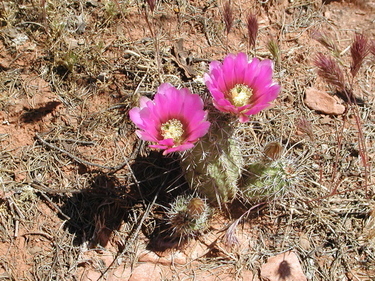 I couldn't handle not including a picture, so here's a barrel cactus bloom from our mother's day hike in Sedona this year. I'm so depressed, I can't even cheer myself up by surfing blogs or by shopping. If you've been following my saga, my laptop's hard drive has gone kaput. No problem, I always back up my data. And I got a new laptop yesterday, yay! But I tried to restore from backup, and I found that my backup is corrupted. I tried to rebuild it last night, but it didn't work. I'm trying again today, but I'm not optimistic. I called DriveSavers, and the overly calm and reassuring man there told me that it was no problem, they could probably recover lots of my data, for only $500-$2700. Ack. This morning my plan is to sit here in shock and see if my backup can be recovered. It's like watching water boil, only slower. So to everyone out there: make sure you back up! And generally it's thought that one backup isn't sufficient. I had a scheme of leapfrogging backups, where you back up to one set one week, then another set the next week. The advantage of this is that if one set gets corrupted, you're only a week away from your latest work. But of course I had let these slip, so I had only a single backup, and my most recent one before that is a year old. My computer is dying. The hard disk is making all sorts of noises, and is recognized only some of the time. I'm in the process of deciding what new computer to buy, trying to get work to pay for it, etc. Sorry I've been ignoring everyone and everything blog-related recently, but I hope to be back online soon. My new computer will be an apple of course, but which one? I pretty much decided on a clone of my current system (but newer), a PBG4. I've had a great 3.5 years with my current one. 3.5 years! That's ancient in computer terms! [Update, Wednesday, 25 May] My new computer is getting closer! I love fedex tracking. It left Phoenix 1.5 hours ago, which means that it's within an hour of being here. Well, not *here* but in my city, which is very close to actually being in my hot little hands. I should get it this afternoon! I've thought about posting about what I'm working on (baby bonnet, felt flowers), but it just doesn't seem right without pictures. Soon, though. Max's flannel comforter, I finally finished tying it this past Friday. I was browsing the fabrics at JoAnn's a few weeks ago, and found a great sale on kids' cotton flannel prints, only $2/yard. So I bought 2 yards of this space print, plus the yellow mottled backing flannel. If you've never made a comforter like this before, here's how to do it, it's really simple. 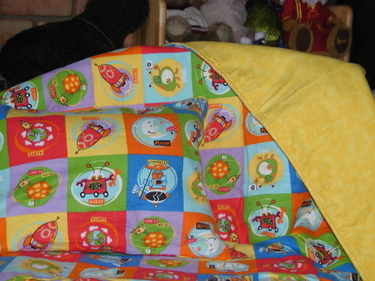 I put down my cotton batting (I used Quilters Dream Cotton batting, the 60x46 inch crib size), put the backing fabric (yellow) on top, right side up, then put the front fabric (space squares) on top of that, right side down. I sewed about a 3/8 inch seam all around except for in the middle of one side to allow turning. I turned it right side out, hand-stitched the opening closed and did a top stitch all the way around, about 1/4 inch in from the edge. Then I tied it at intervals within the comforter. Thanks Carabeth for working on what the intervals should be to keep everything symmetric! I had enough fabric left over for a small pillow case. It was the perfect size for a small "travel" pillow I had bought for Max a while back. I've been lax about my blogs lately. I had to finish up an encyclopedia entry at work. The deadline is Friday, and I finished it yesterday. Two days early! That is so unlike me, the master procrastinator! But recently, say in the last 3.5 years, I've realized that I can't stick to my old ways. If I do put off some work until just before a deadline, that's a pretty good guarantee that Max will come down with some asthma-inducing cold out of the blue, and end up in the hospital in 3 hours flat. Luckily he hasn't been in the hospital in the last year. But the year before that, he was in every other month during the winter. I think that he picks up on mom's stress level at work, and that made his colds worse and led to asthma. I'm just now realizing that he started having these asthma problems when I started working more hours. Sigh. Max seemed like he was getting sick earlier this week, so yesterday I kicked it into high gear, and spent 10 hours writing, researching, revising, writing, and finally finished the entry. I sent it off to the editor and then dashed out the door to pick up Max from daycare. I'm thinking today that I should re-read it, but I can't bring myself to do that. They'll let me know if they don't like it. On another note, has anyone read/used The Artist's Way by Julia Cameron? This was recommended to me by a friend, and I'm thinking of starting an artist support group within my sewing group to go through the exercises. I was wondering if anyone else has done the same and has any comments or suggestions. As for crafts, I'm working on a simple flannel quilt for Max. I guess it's really called a comforter because it's just two pieces of flannel with some batting between, sewed along the edges and then turned inside out. I'm going to tie at intervals in the middle, but first I have to come up with a good scheme to subdivide 10x17 squares in an orderly way. Because asymmetry would drive me crazy. I wished I'd realized this earlier, I would have just chopped off one row so that it would be 10x16 squares. That would have been easier. And here's an example of my husband's craft. Stephen does woodworking, which means that we can't park the cars in the garage because it's filled with equipment. (My hobby just takes up the guest room, except this weekend when I have to clean it out so my inlaws will have someplace to sleep. Actually, I'm realizing this isn't correct. My hobbies also take over the dining table, the living room couch, etc. At least Steve's are hidden behind the garage door.) He's made some really nice closet pieces, bottom segments with doors and upper open shelves. Now he's working on cabinets for the library/office/cat spa. Last week he was working on something in the garage, it was a strange block of wood, I couldn't figure out how it fit into the cabinets he was building. He explained about it being used for opening the drawers somehow. It's a little scary how well and quickly he can come up with a cover lie. 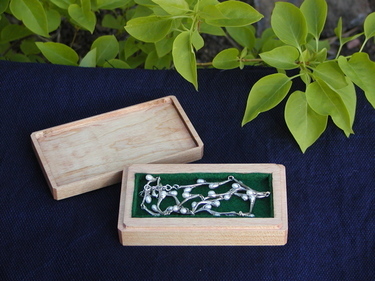 What he was really working on was this box for a necklace he had bought me for my birthday! It's a beautiful, simple box. At first I couldn't even see the seam, and wondered why he was giving me a block of wood. He had routed out the inside and lined it with felt. I love it. The necklace is very nice too, it's one I had commented on quite a while ago, I can't believe that he remembered! It's a pussywillow necklace, with pearls for the fuzzy buds. Friday was my birthday, the big 4-0. I had thought I would feel angst about this, but it seems that lately all my angst is reserved for Max (Am I a good mother? Will he be ok? What is the meaning of it all?). Which is not to say that there's a lot of angst, just that when I do find myself in this state, more than likely it relates to Max. This is my "work" birthday cake. At my husband's work, people bring in cake and goodies on their birthday. I think it's a good idea, so I made one to bring to my work. 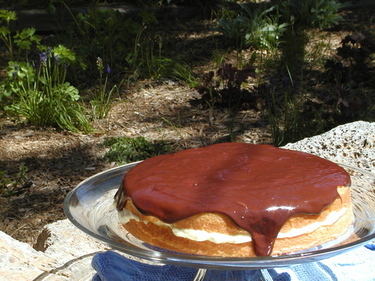 Boston Cream Pie, a favorite of mine while growing up (I'm from the Boston area). The recipe is from Baking in America. It's really rich, yum! In Japan, the fifth day of the fifth month is Boy's Day, Tango no Sekku (also known as Cinco de Mayo in my area, but that's different). It's now called Children's Day, Kodomo no Hi. Girls have their own day too, Hina Matsuri, on the third day of the third month. 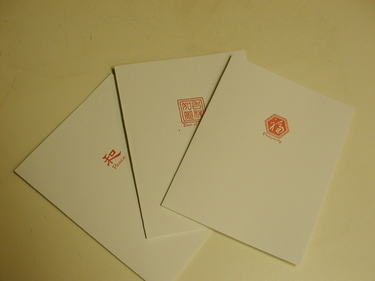 For our celebration of Boy's Day, besides the koi nobori, I've printed out a bunch of the koi origami patterns so Max can take them to daycare and everyone can make them. We also made chocolate cupcakes together. 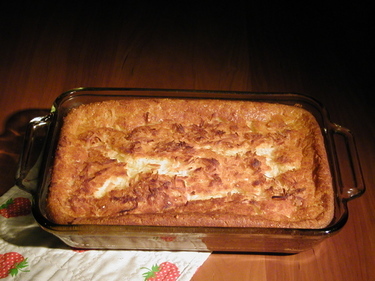 And here's some butter mochi that I made from from Susanne's recipe. I'd never tried this kind of mochi before, but wow is it yummy. Very rich. Hillary posted this link to a very cool baby naming site, The Baby Name Wizard. 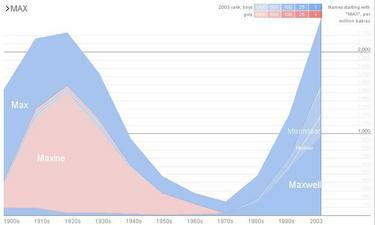 They have a java application that will plot a name's popularity over time--I love it! Here's Max's graph. Max is actually a Maxwell. I like names that can be shortened into nicknames. I was very much against naming him with a name that's traditionally a nickname. I know this is popular now. I think I feel so strongly because I didn't like the nickname Mandy. It's what my parents always called me at home, which was OK, I just didn't want other people to call me that. I liked having the power of choice, being able to decide myself what to be called. Max's other nicknames are Maxi, Maxito, Maxi-hoo-hoo, and probably a few others too. One full-length version that I found at the Name Voyager is Maximino, I hadn't heard that one before. But we do know a Maxstar! 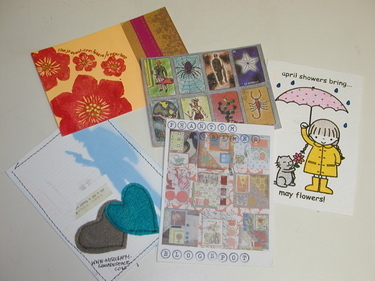 My postcards from the postcard swap have been coming in--such beautiful work! So far I've gotten postcards from: (around the circle, starting at lower left) Joelene at misocrafty (the very first one I got! 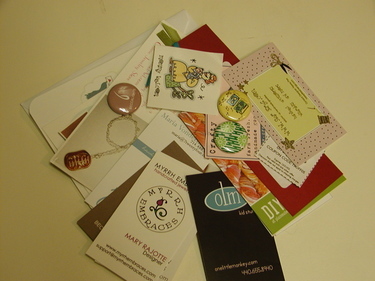 ), Bernadette at sugarloop, Veronica at peaceloveandfuzzybunnies, Myra at my little mochi, and Cat at phantom crimes. A big thanks to everyone! And I got my order from Maria at 7twentyfour. It was ridiculously fast: I ordered on Saturday, and it was here on Monday! Wow! The cards are beautiful, plus I got this great indy goody bag!